She thought she could move on and break free of her fears–that if she had some space the pain would stop. But as memories resurface due to an ill-timed joke, the past crashes into her present once more and she didn’t see it coming. A young adult romance, this novella would be a great book for teenagers or as a feel-good summer read. Short, sweet and excellent! Mia Hoddell has created complex characters and a well rounded plot in the space of a mere 160 pages, so bravo! I loved this book! You can clearly see how Jenna grows through a short amount of time and Ethan is simply Hottie McHottie pants (no complaining though wink wink). Not only did I like the budding romance, but this is just one of those feel-good summer romance stories that take you back to the sun and surf (especially since the autumn chill is starting to set in here at school). Even though I wish it could have been a little longer, I still think the story works really well because it leaves you wondering what is going to happen next. Hopefully there will be some hints in the next one of the series (even though I know that one is about Jenna’s friend Amy). Nevertheless, I am excited to start the next novella in the series and can’t wait to see what Mia Hoddell has in store for us next! Killer cover–not to judge. 🙂 Thanks for the review! Thanks for the great review, Paige! 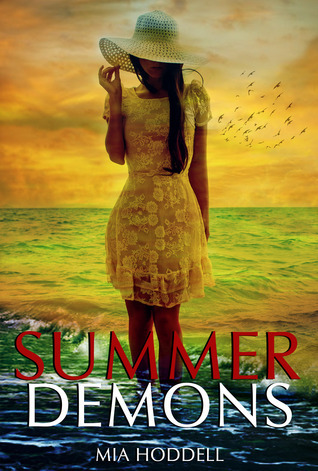 I’m so glad you enjoyed Summer Demons. I’ve just finished writing a bonus scene for Ethan and Jenna actually, so there is a little more to come from them 🙂 I’m aiming to put it in a box set I’ve scheduled to release at the end of the year with all 4 novellas.